The idea of heritage as a “capital of irreplaceable cultural, social and economic value” was already present in the European Charter of the Architectural Heritage, adopted by the Council of Europe in 1975 (par.3). Today, this discourse is getting increasing attention on the research agenda. Some argue that, although heritage is always valued highly, the current interest in the impact of heritage is caused by the democratisation of heritage and the increased importance of heritage in today’s society. Others argue that a universal scarcity of funds for heritage management and conservation is the reason to give it its proper attention. 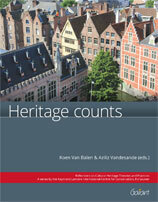 Therefore, the Raymond Lemaire International Centre for Conservation (University of Leuven) considered “Heritage Counts” a relevant and timely topic for its yearly international conference, the “thematic week”. This edition twins with the “Cultural Heritage Counts for Europe” project, funded by the EU Culture Programme. The opening day of the conference was co-organised by the lead partner of this project, EUROPA NOSTRA, and brought together European policymakers and international researchers involved in cultural heritage. This volume specifically reports on the lectures and fruitful debates on heritage impact during the 2015 thematic week. It was observed that evolutions in discourse and policy hold a significant prospect, which also entail an increasing demand for shared insights and formation. In response, this publication reflects on heritage impact by providing research, case studies and reflections that can serve as baseline records, guidance - and hopefully inspiration. The findings are subdivided in three main chapters: “Framing the paradigm”, “Impact assessments: research, methods and practice” and “Linking management, conservation and sustainable development”.